Escape to sleek, sophisticated elegance on the bluff of Amapas, one of the most exclusive areas of Puerto Vallarta. 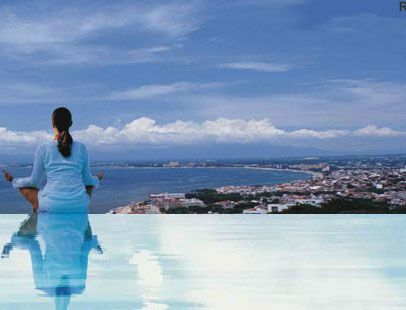 Stand on the oversized, private terrace and view the ocean, double Infinity pool, town and surrounding jungle hillside. Walk to Old Town Vallarta and enjoy local shops, galleries, restaurants or the sands of Los Muertos Beach. We hope you will enjoy our home and the warm Vallarta smiles of the residents. After inspecting other developments we fell in love with the finishes and the location located on a bluff just a short walk down to Los Muertos beach and the nightlife of Puerto Vallarta. Our commitment to quality was to create a luxurious getaway that makes us look forward to return visits every time we leave. Enjoying the light breeze as you peacefully enjoy the sweeping view of PV from the terrace or the pool is spectacular. But the nightlife and beaches of PV are a quick walk or short cab ride away. You will enjoy the proximity to town and peacefulness of the location. Finished in marble and local woods the bathrooms are luxurious with artwork from Michael Costantini and turkish bath towels. Two phone lines are available featuring Vonage service with a Seattle phone number and a second local Mexico phone line too. New state of the art TechnoGym and fitness center overlooking Banderas Bay with air conditioning. Fully stocked kitchen with serving platters and plastic glasses for the pool area. Commercial style kitchen with Italian cabinetry, stainless steel appliances and commercial stove and hood. Coffee maker, toaster, mixer, blender and commercial espresso machine. Satellite receiver with US and Canadian News and Premium channels. 42 inch top of the line Samsung flat panel Monitor with Bose 321 Entertainment center. Movie channels are included. The best location, the most amazing infinity pool, and a professionally designed interior. What more could you ask for in PV?? The bed was so comfortable, and the kitchen is equipped with everything you need to either get out the door with a good breakfast or have a really nice dinner if you feel like staying in. The guest book helped with tons of info on where to go. We loved it!! Beautiful views, very spacious apartment and extremely responsive and helpful owners. We were in PV for 10 days in January and couldn't have had a better experience with our stay. The condo exceeded our expectations. This property was perfect for our group of five adults in terms of size, location, and amenities. The condominium is very secure and has only one access point. While this enhances the security, it was designed for those with a car. Without one, you’ll be walking past a security desk/car and and down the ramp. It’s practical just a bit awkward. Good WiFi, responsive property manager, and frequent cleaning service were all other strong points. I would definitely consider staying at this condo again. The first floor location close the the pool was great. Wes and the staff are very attentative and the condo looked even more amazing in person. Tried to contact the property’s manager no success. Flowers can be delivered to unit (ask me about this service for a discount) and other excursions, car rentals, and amenities are available through referrals too. Property Manager also offers grocery delivery and other services too.